It’s not the suffering you feel because you’re mistaking loss for love, it’s not your strangling paranoia of not getting what you might deserve, it’s not the fear of the other, even the stranger taking what’s yours, neither is it religion promising you redemption in the afterlife, and it’s most certainly not the money or the work along with its ridiculous salary you’re being sold as the only purpose in return for sacrificing your lifetime. Nor is it the thrill, the intoxication, or the torment you’re searching for in the outer world to make yourself feel, and of course it’s not the push-button amusement of the media, either manipulating your fear or poisoning you to perpetuate your blindness. Neither is it the narcissistic globalized networking culture taking advantage of the compulsive self-exposure you’re trained to manifest in order to be able to control you by suggesting the illusion of a meaningful, an important life. All of this is merely meant to repress the cannibalistic emptiness left by your own erased self, corroding you from within so that the big machinery functioning for the benefit of a few can continue to sprawl inside you until it will have erased you. It is meant to force you into invisibility and to fill you with shame, to make you stay in line and prevent you from perceiving your inner emptiness, from turning against the principle of collective erasing of your own being. You need to recognize that the real reality is nothing but a standardized desert, your personal gap into which an endless row of fata morganas is projected while a small minority has taken possession of the oasis. Nothing of what is advertised to you as being new and bearing hope, promising to change your life, will be achieved or ever happen, as your fear of a sudden end is nurtured simultaneously. What is left is the empty shell of the promise you were chasing, kept up systematically by propagandistic advertising, slavishly consumable. You need to overcome the fear of a radical about-face, of a rejection of what is by realizing that all the candy served to you on the tablet of illusion to make you believe in your identity is poisoned and paralyzing your real self until it dies, until you’re dragged along the dictated path like a crippled puppet on a string. 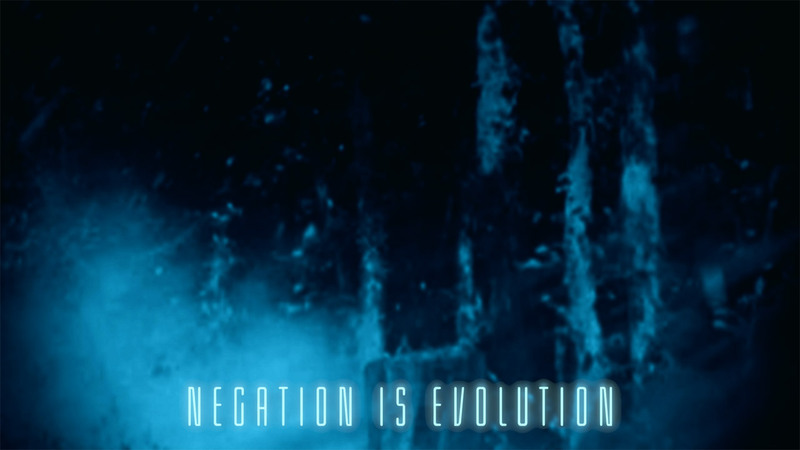 You need to believe in the beauty and the creativity of negation, negation is evolution. Feel your real self in it, and there will be no more fear, no more target of manipulation. Make use of the melancholy of the loss which can turn into rebirth and you will see that you can celebrate an end as a true shiny beginning. There’s nothing terrible about a conclusion, a dissolution, a disappearing or a loss, as it bears the chance of a bright new way of thinking. But he who is not prepared for the crossing of the horizons of the possible, who, by fear of recognition of his own inner emptiness, clings to the alleged knowledge of others in the crucial moment will leave the field to those who are making profit of the fear of a fundamental shift now already, and who will avoid a true resurrection in the future, pretending to know what’s best for all. Before it comes to this moment of negation of the past life, you need to be fraught with your own innermost truth in order to make your way to the enlightenment of the dawning new era. Start to celebrate the loss in your life in order to get to the other side, to the place where you will start existing. Learn to recognize what is in agony, and turn it into real existence. Make decisions beyond seduction and lie. Dare to make radical separations in your life. Accept the help of destruction to get rid of what makes you hollow. Choose the path of greatest inner resistance to liberate your will of its deadly rigor. Face your inner infinity and start a process of a spiritual distinction to reach the moments of truth. In these moments of truth, you will not fall into the hole of your hollow transparent self again. The ghost of your extinguished self will not stare back at you from the mirror anymore, as you will melt into your own reflection and refuse to sacrifice your true self. The final about-face, the ultimate farewell, the discarding of the past, the great moment of negation will not be a catastrophe, for we, the initiates, will perceive it in its beauty and know how to make use of its force, recognizing each other by our self-fulfilledness. Together let us desire, conceive, and create the new enlightened world of the future, which will embrace serenity and truth and happiness in one unity and which will one day rise heavenwards from the hands of a million initiates like the crystal symbol of a new faith.